From Left to Right: Board of Overseers Chairman Patrick Barron, Dr. Doug Lehmann, Dr. Daniel McGibney, Dr. Yongtao Guan, and Dean John Quelch. The professors received the Dean's 2018 Appreciation Award during the Fall 2018 Board of Overseers meeting. 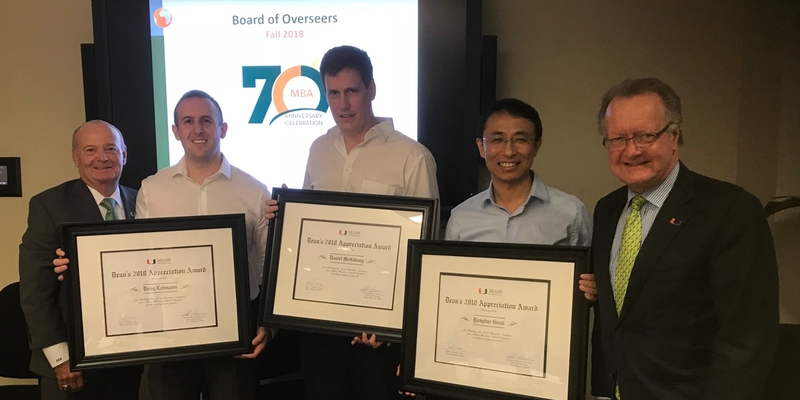 The Board of Overseers meeting took place at the Miami Business School on Thursday, October 4. At this semester’s meeting, Chairman Pat Barron and Dean John Quelch presented the first Dean’s Appreciation Award. This award acknowledges an individual or team who have given outstanding service to support the strategy of Miami Business School. This year's award was presented to three faculty members in the Department of Management Science: Dr. Doug Lehmann, Dr. Daniel McGibney, and Department Chair Dr. Yongtao Guan. This team of professors spoke about how much they have enjoyed building the Master of Science in Business Analytics program and working with an ever-increasing number of students. According to Dean Quelch, "These professors are dedicated and examples to us all when it comes to working with students and corporations to ensure their career placement upon graduation." They have grown the MS in Business Analytics to become MBS’s highest enrollment graduate degree program with almost 100 students enrolled this year. Vice Dean of Graduate Business Programs Patricia Abril also spoke of their high-level of professionalism and their dedication to strengthening the Business Analytics course content and student experience. "The MBS Business Analytics success is directly correlated to the strength of the professors that lead the program. This award is so richly deserved by these individuals. I was honored to be a part of their recognition," said Barron. In a recent interview with El Economista, Dean Quelch stated he believes that the program will soon be in the top 10 worldwide.